From Tri-Cities Regional Airport/ Johnson city/ Bristol. (1.5 hours)Exit airport and turn left onto TN-75 south for 6.8 miles. Merge onto I-26 via ramp on the left. Travel 50.6 miles. Take exit #9/ Burnsville/Spruce Pine onto HWY 19 N. Follow 17 miles to Burnsville. From Charlotte/ Douglas International Airport (2.5 hours). Follow Rental Car Road to Little Rock Road. Go left. Follow 1 mile. Merge onto I-85 South via the ramp on left toward Gastonia. Go 15 miles. Merge onto I-40 (exit 43A-B) toward Statesville/Asheville. Go 36.5 miles. Take exit #86 Shelby/ Marion to NC 226. Go 13 miles to the light. Go left and follow to the right. Stay on NC 226 for 10 miles. Take exit #9/ Burnsville/Spruce Pine onto HWY 19 N. Follow 12.5 miles to Burnsville. Take I-40 East to HWY19. Go east toward Asheville. Merge onto I-240 East. Quickly merge left onto US-19/I-26 via exit 4A toward UNC/Asheville/ Mars Hill/Weaverville. Go 18.5 miles. 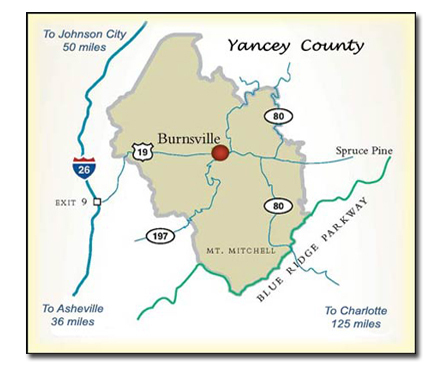 Take exit #9/ Burnsville/Spruce Pine onto HWY 19 N. Follow 17 miles to Burnsville. Please contact us for final directions to Farmhouse. Lisa and Bob would we love to hear from you and assist you with questions or your reservation. The property is stunning. Beautiful grounds, and gorgeous on the inside as well. We visited during a cold snap, so didn’t get a chance to take advantage of the fire pit, but the farmhouse was so comfortable and cozy, very tastefully decorated, and includes everything you need for a restful getaway. I slept in the downstairs bedroom and the bed was soooo comfy. I would love to come back when the weather is warmer and enjoy more of the outdoor amenities.